Regular readers of my Weblogs know full well that I believe in healthy skepticism, as it helps us obtain adequate information instead of accepting unsubstantiated claims. Were those ads really rejected for inclusion in a Super Bowl broadcast? Maybe, maybe not. But it's not exactly a serious claim that can change your life, is it? Fact-checking comes to the forefront when something is on the fantastic side. I've come to expect atheists and evolutionists to believe and pass along negativity when it comes to Christians and creationists, but it really burns my prairie schooner when Christians embarrass themselves (and other Christians) by neglecting to do a bit of fact-checking before passing along wild stories. Some even pass along material from parody sites without checking the sources. This child believes in asking questions and getting details. The end of the world is a good example. Ready to head for the hills? 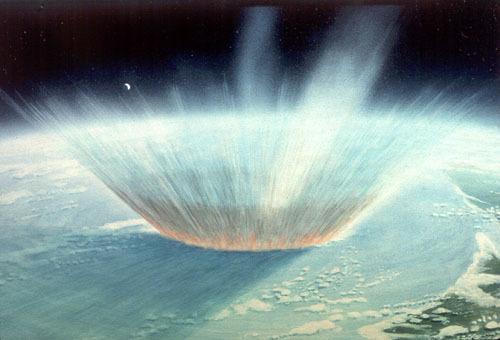 "RUSSIA WARNS: Asteroid Impact in Atlantic Ocean". Really, Russia is giving the warning? I'd like to know where American scientists as well as those in other parts of the world stand on this. Tom Lupshu apparently is the author of this piece. "Russian Military Operatives who have family in the United States have warned of an upcoming event of a large Asteroid that is being tracked by their missle defense systems." Really, Tom? I reckon many of us would like to know which military operatives, and how you know about it. "This Near Earth Object is arriving along with the Meteor Debris field expected to impact FEMA Region Three." You're not telling us where FEMA Region Three is, which would be nice. Let me help: this region is on the Eastern coast of the United States. It wasn't hard to look up. "Russia Warns that this Large Asteroid will Impact in the Atlantic Ocean. This will be a Global Incident. This event will change life on this planet as we know it. Good Luck to you and your Family." Which is it, global or just a few states? It's followed by a strange video and a link telling us, "Emigrate while you still can", which is selling stuff. Remember, this threat is imminent, so a global disaster could happen at any time, say the unnamed sources. When was the article written? It doesn't say. A bit of investigation shows that comments are at least two years old, and the video was conveniently date stamped by YouTube as December 22, 2013. The world ended, and I missed it. Bummer. "Asteroid Warning: Govt Preps Underground Bases". The subheading is, "NASA warned in 2010 of an asteroid on a trajectory to hit off of Puerto Rico, causing a massive tsunami". So, we've been warned. Who warned NASA? In the mishmash of data about asteroids, near-misses, we don't really know when it's a-comin', but it's a-comin' soon, according to this January 12, 2015 article. Then they linked to that weird video from the previous post. The site also had a source in Rev. Efrain Rodriguez. "Rodriquez is not an astronomer who studies celestial bodies such as black holes, moons, planets, stars, asteroids, comets, nebulae and galaxies but he is a prophet who preaches the word of God and has a message from God. Yes, you read it correctly. Rev. Rodriquez said that he has a message from God that will make you sit up in your seat and maybe even fall on your knees." Well, there you go! Wait,who? And he has a personal revelation from God? Not hardly! Too many Christians fall for this "God spoke to me and gave me a message" nonsense that is unbiblical, but to use this kind of false prophesy stuff to bolster "science" about an asteroid impact is beyond the pale. Now, I detest the genetic fallacy (rejecting information out of hand because someone doesn't like where information originates, which is a favorite tactic of atheists), but it can be valid when a source is suspicious. The two linked above were from sites that claim to have inside knowledge about conspiracies, survival in disasters (often with links to buy stuff), and "nobody else is telling you the truth". Does the source's origin automatically mean it's wrong? No, but material should have further investigation from more reliable sources. Closer to home, I've seen people united in both hate and admiration. Some will accept the words of another as truth, but the "truth" may need checking. Atheists have lied about me, and their supporters have gleefully believed the negative reports (including a false Christian hiding behind a fake name because he claims creationists are out to kill him!) The opposite is true. Rev. Guy I. Admire said something that fits someone's paradigm, so it gets passed along. In fact, I've heard some really great comments in lectures and such, but since I could not verify them, I did not use them in posts and articles. Unfortunately, I've slipped up, and the embarrassing experiences have helped me be more careful. Just recently, I made a comment on a post that was destroying the bad reasoning of a pro-abortionist who pretended to be pro-life. The pro-abortionist was not named in the post. Later, I received a message from someone who claimed to be the "victim" of that post, he was horribly misrepresented by the Christian who runs that Page, and so on. All I had to go on was what I read, and my belief that the Page owner (who probably was the Admin who wrote the post) would be a fair dealer. Screenshots? Nothing from the one complaining to me, and no screenshot on the post. It would be a bit of exciting, sensationalistic news to spread this, "Hey, this guy wronged someone" news, but since nothing could be substantiated either way, I didn't take it further. But I did remove my comment on that post, since I was uncomfortable with the doubt. From a different angle, I was telling a co-worker about a criminal Internet stalker who constantly calls me a liar (being unwilling to accept the difference between dishonesty and disagreement about scientific evidence). She looked surprised and said, "You don't lie!" What if I used her as a sort of character reference? People would be correct in being skeptical, and wanting to know how well she knows me (not that well). On a television interview show, the guest made a remark that Intelligent Design is simply a way to sneak religion into schools. The host accepted that lie and opposed ID as well, but he didn't bother to do any investigation about what the ID movement actually teaches. One common thread in these things that I've noticed is that people "think" with their emotions, and get excited about passing along information that catches their fancies. I'm simply calling for a bit of caution and verification. There are times when we can overdo it. If you want to watch a video collection of ads that were rejected for the Super Bowl, fine, watch it and have fun if you're into that. No need to be contacting the producers and demanding the rejection paperwork as far as I can see. It's the more serious stuff that needs more care.